Winter break is officially over after this weekend, and I don’t know if I’m ready to get back to the grind quite yet. This break hasn’t been as productive as I wanted it to be, especially in the book-reading department. I had a list of books I wanted to get through, but I just couldn’t make it through all of them. I was only able to finish The Cupcake Diaries series (a cute little kids series from Simon Spotlight) and The Night Circus by Erin Morgenstern. Oh my, The Night Circus was absolutely amazing. It actually took me a bit less than two weeks to read it, but it was worth every second. I had been itching to read it since August, but timing was never right and The Strand never had a used copy available. I finally got my hands on a copy, though. When I first heard about this book months ago, I believed it to be a YA novel, but then I read that the author is very adamant about the fact that it is not. The length of time it took me to read it is also a testament to the fact that it is very much a work of adult fiction; I can usually get through a considerably long YA book in a matter of a weekend, but The Night Circus has so many details and intricacies to it that I was forced to slow down in order to even try to take it all in. The tendency to jump between years in each chapter was a bit troubling at first, but by the end of the book I was able to get the timeline straight.This book is definitely something I would not hesitate to read again, because I am sure that I missed at least a few things, especially in my moments when I was half-asleep reading. The characters are well-developed and the plot is not so predictable that reading becomes boring. I’m also in love with the book’s physical design. If I may say, it’s very classy. The jacket is wonderful with its black, white, and red coloring (the same palate as the circus itself), and the actual cover is beautiful with silver designs inlaid on a black background. I’m a sucker for a beautifully designed book, and these colors all come together in a wonderful way. The only way to describe it is that it’s classy, pure and simple. Okay, enough about The Night Circus. On to my most recent batches of doughnuts! Unfortunately I have no pictures of my improved chocolate doughnuts. They were just too good to wait for natural lighting so I could take proper pictures. Instead, I just have the recipe I came up with, which was inspired the Lara Ferroni recipe I used before. 1.) Preheat the oven to 350F. Lightly spray a doughnut pan with non-stick spray. 2.) Mix together the flour, cocoa powder, baking powder and baking soda so it is all evenly incorporated. 3.) Add the sugar, nutmeg and salt. Stir to evenly incorporate. 4.) Add the melted butter, buttermilk, vanilla, and egg to the dry ingredients. Stir until just combined. 5.) Carefully stir in the finely chopped chocolate. 6.) Fill each doughnut well 1/2 to 3/4 full. I used a spoon. Don’t overfill the wells, or the holes will get baked over. That would be sad. 7.) Bake for about 8 minutes, until the doughnuts spring back when touched. Turn out onto a wire rack to cool. 8.) Once cooled, glaze if desired (1 cup powdered sugar, slowly add buttermilk or milk until it reaches your desired consistency, add a splash of vanilla). The doughnut-making didn’t stop there. I made those ones a few days ago, and I couldn’t resist making one more batch of doughnuts this morning. 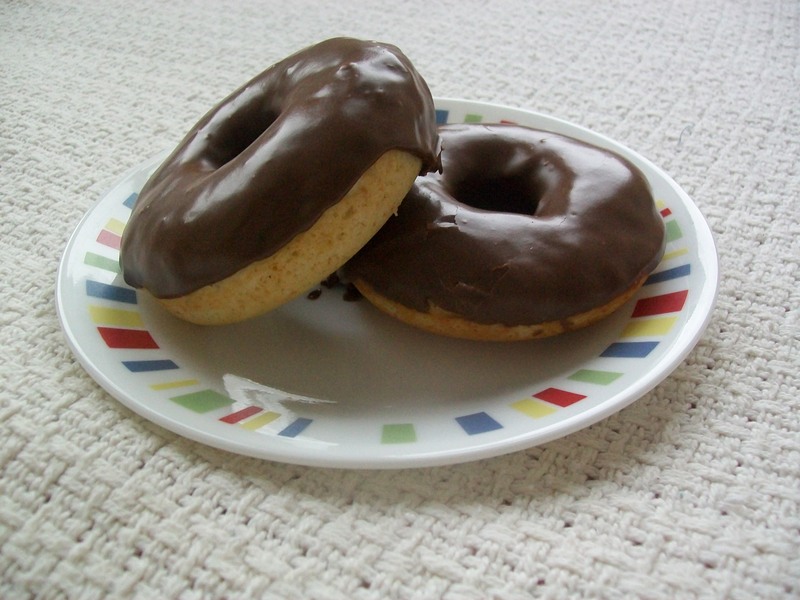 But this time I went with the Baked Glazed Doughnuts from Iowa Girl Eats, and I spruced them up with a dark chocolate glaze. I love me some dark chocolate! I followed the recipe for the most part, but instead of using the cinnamon it called for, I replaced it with my new favorite baking spice: nutmeg! I used a little more than 1/4 teaspoon of that glorious doughnut spice. 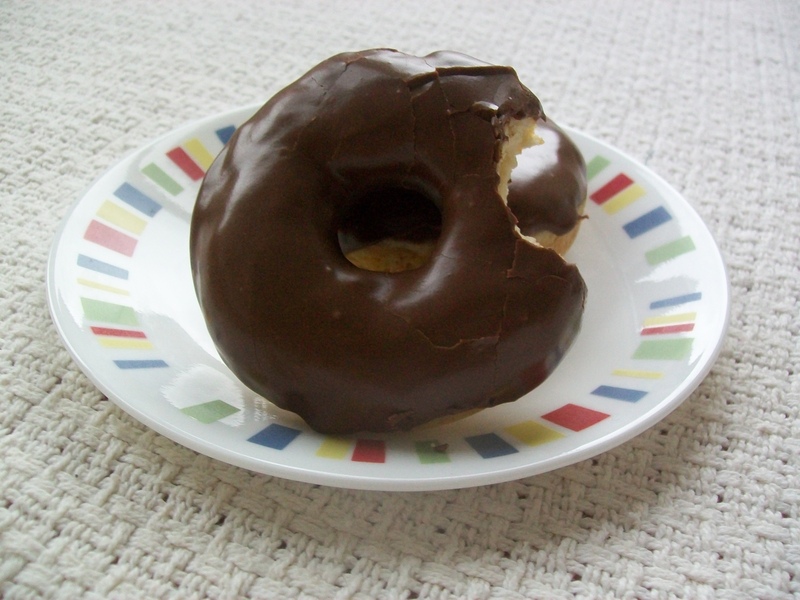 For the chocolate glaze, I shaved 3 squares of Trader Joe’s 70% Pound Plus dark chocolate. Then I added about a teaspoon of milk and melted it all in the microwave for about 15 seconds. Then I mixed it vigorously to melt the remaining bits. I added 1 cup of powdered sugar and a bit more milk to the chocolate and mixed it all together until smooth. As it was there was a distinction between the chocolate and powdered sugar, so I added a splash of vanilla and a pinch of salt. Perfection! 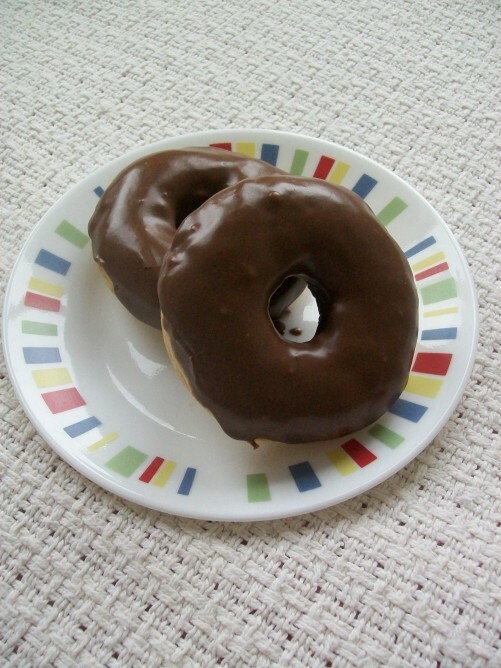 I cooled the doughnuts before dipping the tops in the chocolate glaze. Then I put them aside to further cool and set up. I may or may not have put each doughnut in one of the wells from my muffin top pan. A normal plate was too small to fit all six doughnuts, but the six over-sized wells were a perfect fit. It was fate. I only hope I’ll be able to share the remaining doughnuts with my three roommates and a friend who are coming back to the city tonight. But if not, it’ll be a great excuse to make them again. The glaze really is perfection. I could swim in a vat of it. 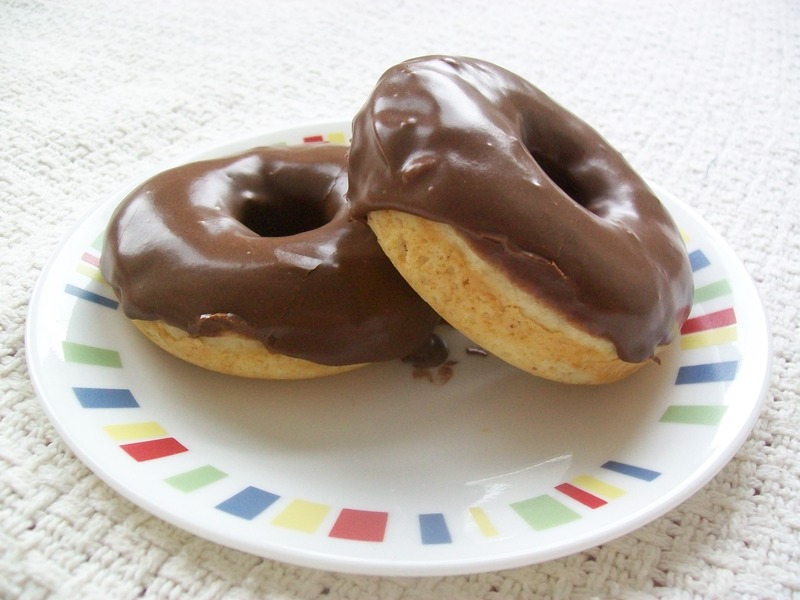 I especially like how it sets up and becomes a thin but fudgey blanket over the doughnuts. Yum!